The burst of colour will fill all your relatives or loved ones with positive vibes. Give this gorgeous bouquet as a gift to someone dear to your heart. Make even the cloudiest day feel sunny. You can always feel spring in the air when you have tulip bouquets around a home. FloraQueen can you share that feeling by sending tulips all around the globe to surprise those you love. Impress with beautiful fresh tulip arrangements anywhere and anytime you want to make someone smile with the freshest flowers. 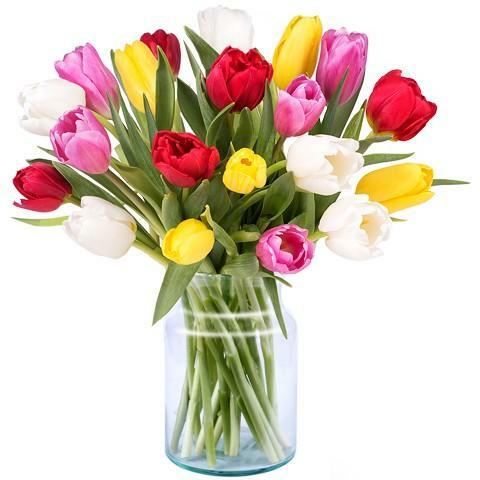 Who do you know that would love a fresh tulip bouquet to add a little “spring” to their step? Known as the “Harbingers of Spring” since antiquity, tulips symbolically signal the end of winter. Coming in many beautiful colours they bring with them a feeling of fresh optimism, rebirth and warmth that the season usually inspires. You always know when tulips appear that summer isn’t too far away. A fresh tulip bouquet will bring smiles to a lot of different occasions. They are among the best flowers to choose for a spring birthday or wedding celebration. However, with their most common meaning being that of “a perfect love” they are ideal blooms to give on an anniversary or to make any day more romantic. In short, they are one of the best seasonal alternatives to fresh roses. Pick the tulip bouquet that will fill your loved one’s day with smiles - Will you impress with pink tulips, purple tulips or a mixture of colours in your arrangement? Choose your delivery date - You can schedule orders up to 3 months in advance! Once your order is confirmed, we’ll take care of the rest. We work with expert local florists in flower shops all over the world so you can always share a professionally hand-crafted bouquet.